Pinching a tomato plant is removing the small branches and shoots that grow in the joints of a tomato plant. These joints and shoots are called suckers. Removing extra suckers from a tomato plant increases the tomato yield for that plant. This happens because the plant's nutrients are channeled into producing more tomatoes rather than leaves or branches. Pinching is also a method of pruning the tomato plant, allowing sunlight to reach the fruit more easily. Determinate tomatoes grow to a specific height and then stop growing. 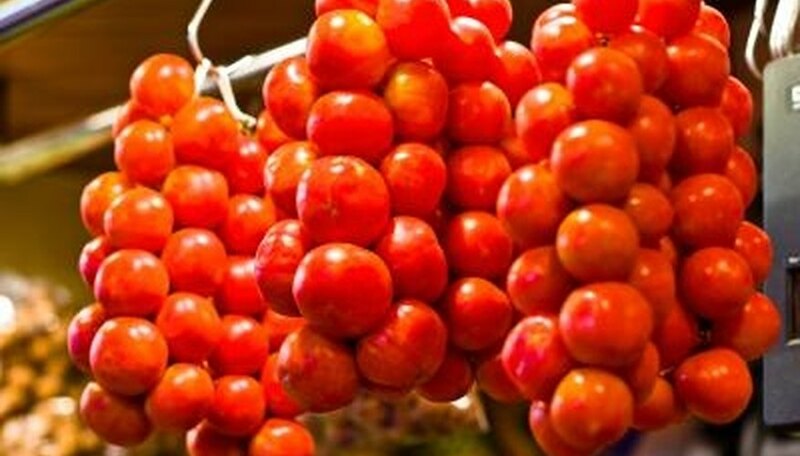 They are bushier and less vinelike in appearance than indeterminate tomatoes. Determinate tomato plants also set all their fruit within a relatively short time frame. Because determinate plants stop growing, they do not need to be pinched. Pinching should only occur if the plant becomes too bushy for sunlight to reach the fruit. However, determinate plants set tomatoes in pairs and groups, rather than individually. This means that if you overprune or pinch a determinate tomato plant, you will receive fewer tomatoes. Indeterminate tomato plants are vining tomato plants that do not have a set height. They will continue to grow until the harvest and growing season is over. Pinching indeterminate tomato plants can help keep the growth of the plant under control. Pinching indeterminate tomato plants will encourage the plant to produce more fruit over a longer period of time as well. Only pinch a sucker when it is less than 1 inch long. The best length to pinch a sucker is when it is half an inch in length. If a sucker grows longer than 1 inch, it becomes thicker and will be more traumatic for the plant when it is removed. Removing a thick sucker from the tomato plant will cause unnecessary stress to the plant. Doing this too often or too severely can even cause the death of the tomato plant. Using your fingers or a pair of gardening scissors, cut or remove the sucker at its base. Do not damage the main stem of the tomato plant. Do not overpinch an indeterminate tomato plant. Remove one sucker for ever three suckers. If you remove fewer suckers, you will have an unwieldy tomato plant that is channeling most of its nutrients and energy toward producing branches and leaves rather than tomatoes. Overpinching will leave you with a very compact plant, but fewer tomatoes. Pinching only the top suckers of the plant will help keep the plant stable and less top heavy. Bottom branches are easier to support than top branches, and you do not need to worry about the top of the plant becoming too heavy to support.